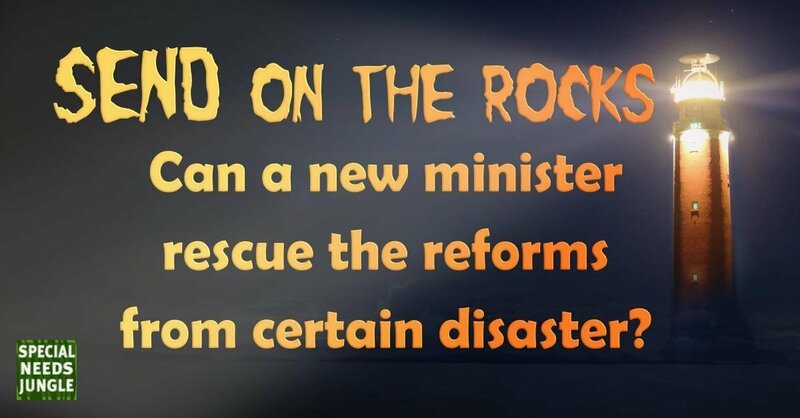 Home SEN Politics SEND on the rocks: Can a new minister rescue the reforms from certain disaster? It's all change at the Department for Education. Not only was Justine Greening knocked off her stool as Education Secretary this week, Theresa May's reshuffle has also done for the SEND minister, Robert Goodwill. Ms Greeening has been replaced by Damien Hinds MP, while Nadhim Zahawi, MP for Stratford-on-Avon, steps in as the Minister for Children and Families. At present, this is where the responsibilities for SEND lie. If that changes, we will let you know. The other thing to note is that the Health Secretary, Jeremy Hunt (my local MP in Waverley), who allegedly hung on to his job by his fingernails, in the end managed to widen his brief to include social care. Of course, this is a more sensible place for social care to sit as the two are intricately linked, but we shall need to wait and see what the effects of having Mr Hunt's fingerprints on social care turn out to be. Mr Goodwill was only appointed just over six months ago after the 2017 election, in the wake of the previous Minister, Ed Timpson (CBE), carelessly losing his constituency in Cheshire. Mr Goodwill came with no SEND credentials whatsoever and this last half-year must have been like walking over a rickety bridge paved with hot coals. He told his local paper he was, "not shocked" at being given the boot. Certainly not as shocked as we were when he landed such a specialist role in the first place. But y'know, ministers are supposed to be jacks of all trades and, therefore, presumably, masters of none. He said: "...It looks like the Prime Minister is wanting to bring in some younger people. ...The Prime Minister called me in this morning and complimented me on the job I had done... " Clearly such a good job she didn't want him to keep doing it. I bet he's secretly relieved to get away from complaining parents. Who is Nadhim Zahawi? And does he care about SEND? Nadhim Zahawi was once, many years ago, a governor of a special school, but it isn't obvious if he has any other experience of the complicated brief, some would say, poisoned chalice, he has landed. This is very, very problematic. We are entering a crucial time in the SEND reforms with the deadline looming for every LA to have transferred from the previous system of statementing, to the new Education, Health and Care plan system. Yet many children still have statements with no hope of them being transferred in the next two months. If your child is one of them our post from SEN lawyer, Hayley Mason, is a must-read. We will have more on this in the coming weeks. 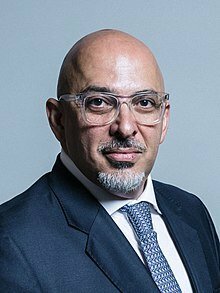 Once a child refugee, fleeing with his parents from the former Iraqi regime of Saddam Hussein, Nadhim Zahawi grew up to be a highly successful businessman. He founded the pollster, YouGov, that now employs 400 people and he previously worked as David Cameron's Apprenticeship advisor. I have no idea whether he looked at the issue of low rates of young people with disabilities with apprenticeships during that time. "... If you are not taught properly at a young age, and find things like reading hard, then this naturally has a pernicious effect on the self-confidence of a child. It opens up the danger that they write themselves off, and give up on learning long before they discover the things that they have a real passion for. Their potential is lost at the earliest stage, all because they have been let down." One can only hope this is a belief that will carry over to his coming work on SEND. He has also written a couple of articles about carers, but nothing specifically about parent carers of children. Still, it's an issue on his horizon so it's better than nothing. In case you didn't know, you have inherited a total mess in SEND. If I were you, I'd hope they shunt the special educational needs brief to someone else because it surely is the eptiome of the Slough of Despond. However, you seem like an ambitious guy. Fixing SEND would be a real feather in your cap. And we would all be very grateful. You can read what's currently wrong (apart from everything) in our post here: The SEND system is fractured, if not broken. Three new reports prove it. I agree it’s the worst time for management to be changing in SEND. While everyone focuses on the reshuffle, DfE issued a tnder this week for delivery of SEND Information Advice and Support nationally based upon existing Independent Supporter and IASS services. Does this mean it is no longer the responsibility of the LA to deliver this? Love this post Tania, am desperately hoping he’s reading (sure he is) ?